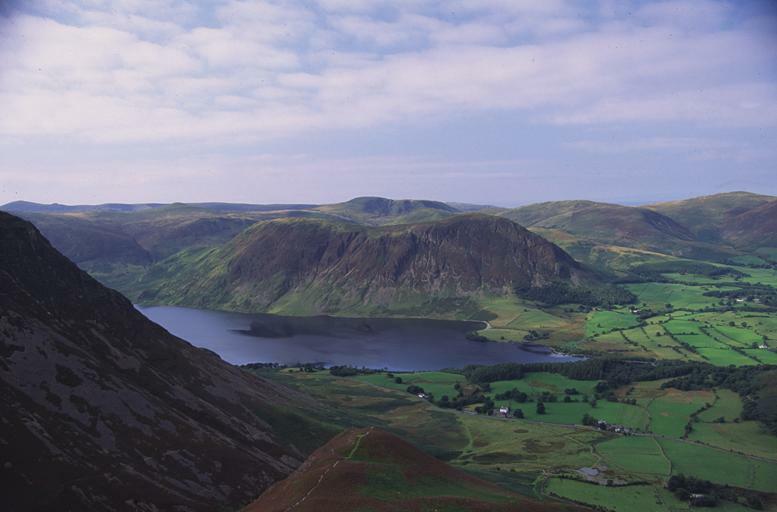 In the foreground on the left are the slopes of Grasmoor, with Whin Ben below us in the centre and the hamlet of Lanthwaite Green. Above the shore across the lake lie the twin summits of Mellbreak. On the horizon, from the left are Haycock, the tiny crest of Little Gowder Crag, Caw Fell, then Starling Dodd in the middle distance. Great Bourne appears beyond the saddle of Mellbreak with Hen Combe between the two. Further to the right are Gavel Fell and Blake Fell. Smaller version of this picture.